As I’m interested in motoring history, one of the things I enjoy about cyclemotors is that they have two histories: that of the engine manufacturer, and the cycle company too. 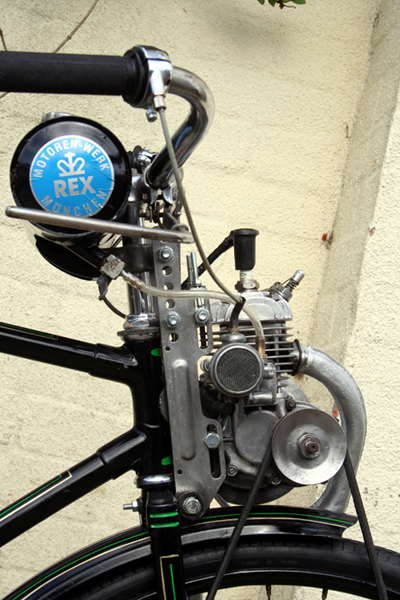 Most cycle-attachment engines such as the Rex were sold to fit to a cycle of your choice. In what other area of our hobby would you have such a unique opportunity to design your own combination of vintage frame and engine? 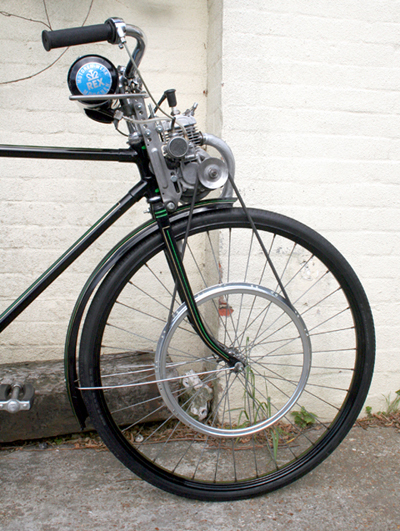 The Rex is my favourite German cyclemotor. I’ve always been a sucker for an engine mounted over the front wheel with tank on the handlebars, probably because it looks so similar to the original turn-of-the-century pioneer motorcycles. 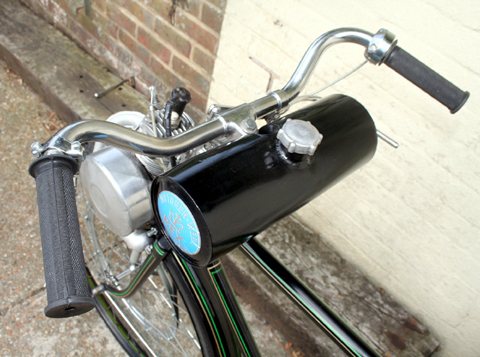 …Our 1950s cyclemotors are, in effect, really just a postwar version of those earliest prototype motorcycles. Along with those pioneer-type looks of a front-mounted engine come various ‘pioneer-type’ disadvantages: there’s often no clutch, and the front end takes a bit of getting used to as it’s considerably heavier than usual. 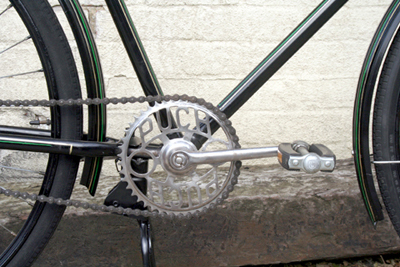 The majority of cycle-attachments were not produced for long enough for their design flaws to be ironed out and updated; and many of the early postwar machines such were still more-or-less prototypes. 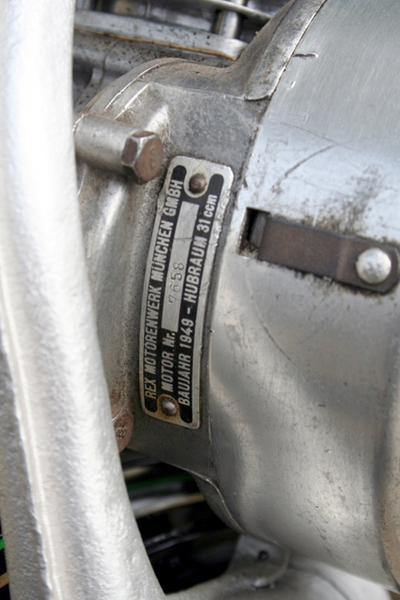 However, most of the German machines were based on sound design technology and well-built: don’t forget the Cyclemaster was originally a German invention. …and, it would seem, is so light that a woman can carry it under one arm without even ruffling her clothes. The Rex has cult following in Germany, where restored running examples such as this command high prices. One advantage of owning and running a Rex is that companies in Germany have re-manufactured many parts. So it’s easy to keep your machine on the road. 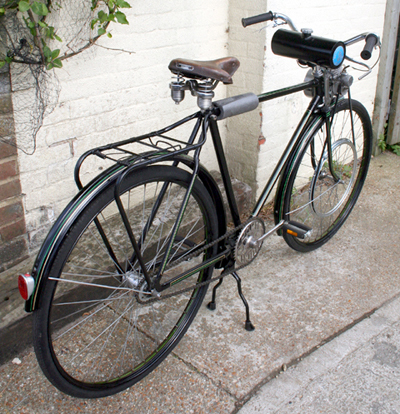 Prices for new parts aren’t cheap, but there again what other 1940’s/ 1950’s cyclemotor has such good spares availability? 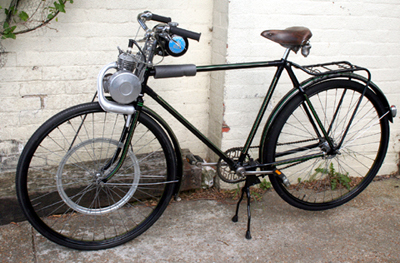 In Great Britain in the 1950’s, the Rex was sold under license as the Cyclaid, a cycle-attachment engine that mounted over the rear wheel instead of the front. Unsurprisingly, the Cyclaid also had an excellent reputation for reliability. 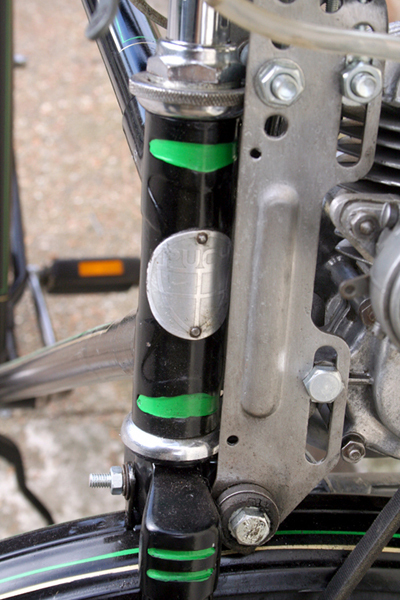 An engine guard (below) was available as an accessory. Next to the engine number on a Rex identification plate is its year of manufacture. Steyr-Daimler-Puch was a large manufacturing conglomerate based in Steyr, Austria. The company was founded as Josef und Franz Werndl and Company in 1864 as a rifle manufacturer, but became known as Steyr-Werke AG in 1924. 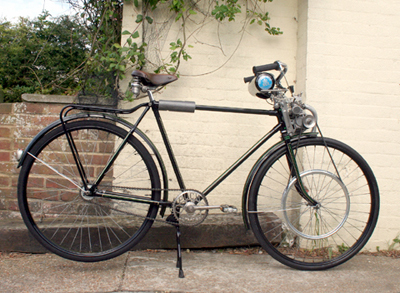 The company began producing bicycles in 1894, and automobiles in 1915. In 1912 Johann Puch went into retirement and became the company’s honorary president. In that year the company employed about 1,100 workers and produced 16,000 bicycles and over 300 motorcycles and cars annually. During WW1 Puch became an important vehicle supplier to the Austro-Hungarian army. However with the collapse of the empire following the War, the market for automobiles shrank and production was discontinued. In 1934, Steyr merged with Puch and Austro-Daimler to form Steyr-Daimler-Puch. 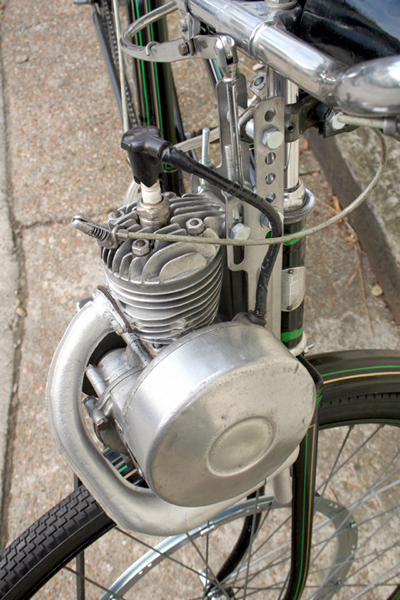 Puch is well-known for its mopeds and motorcycles. 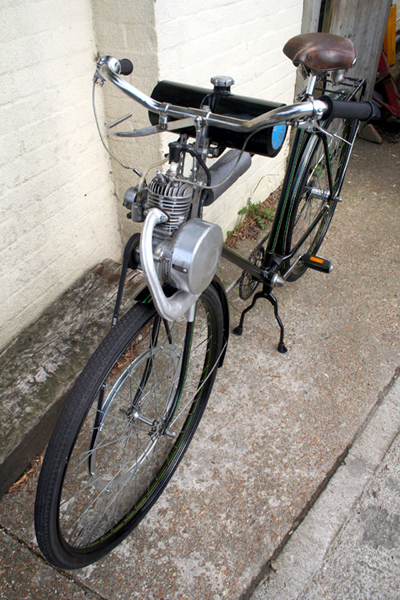 Many motorcyclists today had a Puch Maxi moped as their first machine. 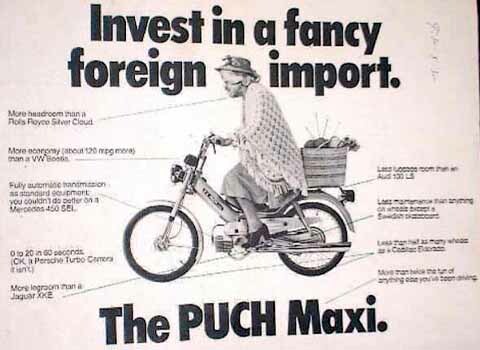 With a decline in the moped market in the 1970’s, Puch cycles had a resurgence and were exported worldwide. But it’s now rare to see one of these old-style Puch bicycles of the 1940’s or 1950’s even in Germany. Old Puch bicycles are as sturdily built as you’d expect. 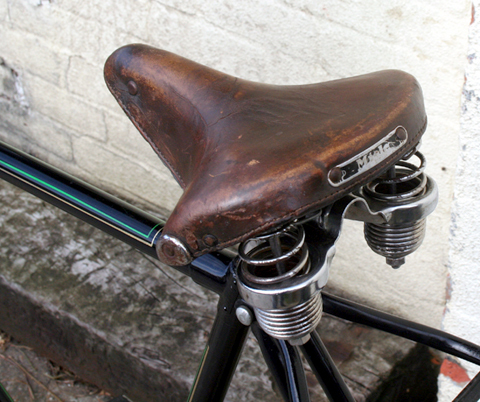 This one has been nicely restored so that it still retains its original patina. 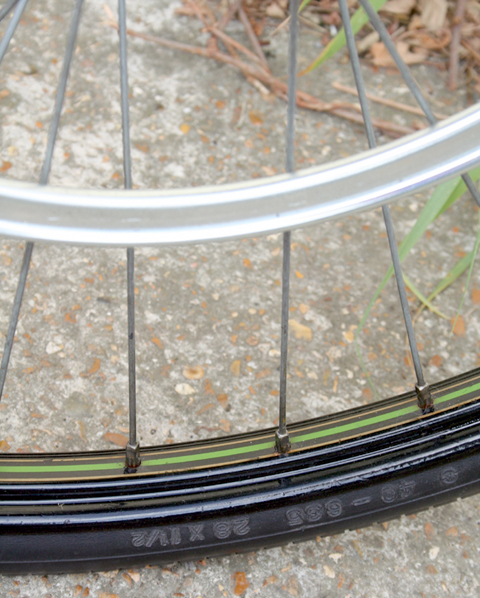 The detail work is good, such as the pin-striping. 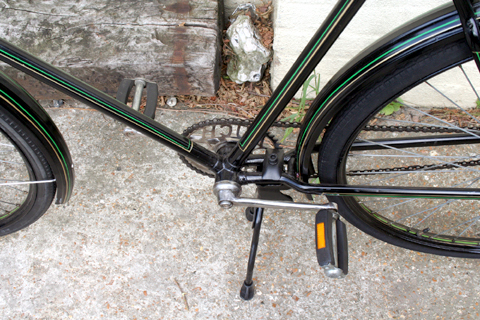 The stand works well (above) and it has good wheels with new tyres. And the bike rides very well. 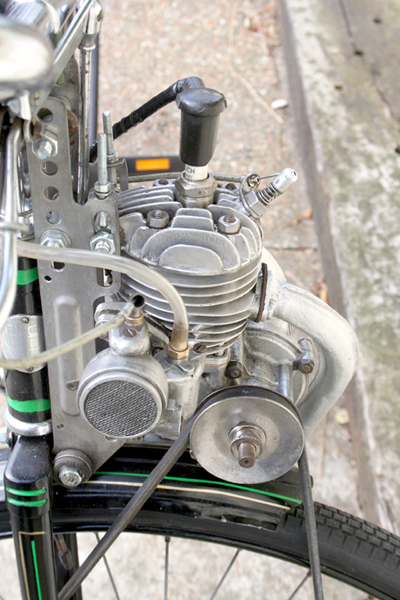 Puch was one of the world’s major moped manufacturers in its day. 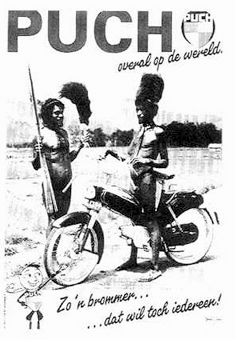 Their ad campaigns used humour to sell bikes. But, over the years, Puch also cornered the market in pin-up posters to advertise their products.